The truth is, St. Bart's (officially Saint Barthelemy, if you want to get French about it) is a truly magical, Eden-like place. Given my previous notions about this tiny, clandestine island, I was inspired to go by my friend, the style sensei Natalie Joos. Tracking her Instagram one day, I was struck by soothing, sun-dappled image after image: gentle waves lapping against a glimmering beach, stark-white deck chairs at sunset, swirling maxi-dresses beside the pool...fresh fish! Granted, my description doesn't sell it to the extent her pics did, but that was it. This would be my escape, I decided, considering both my shortness of time and my need for pristine weather...every...single...day. As I mentioned earlier, St. Bart's is tiny - as in just eight-square-miles tiny. After a day or two, it can feel like your own private island - which, for quick disappearing acts, is pretty ideal. And, the fact that it's also a volcanic island surrounded by dreamy shallow reefs makes it perfect for snorkeling and hiking to hidden coves and beaches (we did a lot of this). In terms of where to stay, there are generally two ways to go: renting a private villa or staying at one of the island's boutique resorts (the smaller ones tend to be a little lighter on the Euro-glitz). And, this leads to one more truth about this particular paradise: St. Bart's is pricey. As opposed to other nearby beachy places like Miami or Mexico, hotels in high season (December to March) can skyrocket, running higher than a month's rent in NYC. But, rest assured, this isn't a place for extended stays (or bankruptcy). St. Bart's is exactly where you want to go post-holiday high season, especially if you feel like dropping out and being a little pampered - by sunshine; an overdose of nature; fresh, simple food; and probably a really, really good massage therapist. 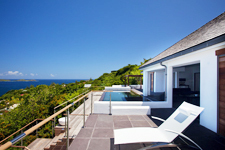 Read on for a few more reasons to add St. Bart's to your spring to-do list. If you're in the market for a tropical reboot, this could be IT. Whether you're going with a group (which can be loads more cost-friendly) or just prefer your own place, head to Wimco Villas, which hosts a handful of modern escapes with all the shmancy island amenities you could hope for. Infinity pool? Check. Oceanfront balcony for reading, sleeping, sipping, and watching the sunset? Check! In-villa massage and private chef? Check, check! WIMCO, Saint Barth?emy; +1 (800) 449-1553.